Jesus was never known to be a fisherman, but rather a carpenter. Not much is known about those pre-ministry years, but we know he was raised in Nazareth and not along the seashore of Galilee. However, after Jesus publically launched his ministry he called a few disciples to follow him who were fisherman. So I presume he got familiar pretty fast with the cleaning process of fish in preparation for the fish market. Well I am not a fisherman either, but I’ve fished over the years since I was a boy and have cleaned a few fish myself. When you get them home and clean them you got to do something with the guts right? To be honest, I can’t remember much about what I used to do with fish guts but I know I must have done something with them. Over a year ago after we moved into our present home my wife observed a neighbor throwing a half filled 5 gallon pail of fish guts, heads and tails under a tree close to our home. The tree was not directly in the front yard, but not far away either. The conversation between us went something like this. She said, “That is really gross, you need to go clean those guts up before the kids get sick from them over something”. I said “I don’t want to clean up someone else’s fish guts. I’ll just go tell him to clean up their own fish guts.” She said, “You can’t do that, they are our neighbors and what will they think if you say that?” I said, “I don’t know, but they should have thought of that before they dumped them next to our tree”. Back and forth we went over what was the right way to handle the unexpected fish guts and what should be done and what would Jesus do? 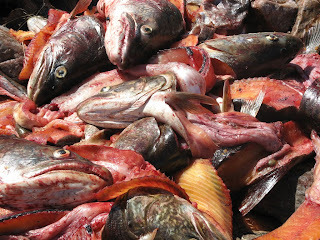 So it finally boiled down to me actually walking over to the fish guts and just starring at fish tails, heads and guts. It was starting to smell as well, since we live in the hot FL sun. My youngest two kids were looking at them as well saying how gross and stinky they were and wondering what dad was going to do. So I went and got my own five gallon pail and shoveled them into my bucket. Then I thought, I know what I will do, I will just dump them right on their front steps and show them. Since nobody was home the temptation grew. After another debate back and forth this time with the Lord, I finally did the right thing with the pail of fish guts. I ended up dumping them in my own garbage can and we smelled them all week long until the dump truck came. Since then we have gotten to know those neighbors and have come to love the entire family in a Jesus kind of way. Had it not been for Jesus in our lives, fish guts might have truly divided us in the neighborhood over those stinky fish remains and how they should have been handled. If it were not for Jesus I think I would have likely dumped those heads, tails and guts in the wrong place instead of my own dumpster. I am not perfect by any means and I know I have pulled my share of gut dumping onto someone else’s turf along the way. But I am reminded today that I can thank my God for the grace of Christ who took upon himself my stinky sinful fish guts and paid the price for me over 2000 years ago. Before I even knew how much my ‘fish guts’ would smell and would offend God he placed them positionally Under the blood of Jesus. Once I disovered Jesus and put them in His pail they never were to again smell. Today I have a different type of ‘fish guts’ that recently got dumped into my life’s front yard by different folks. These folks are actually my brothers and sisters in Christ. As I pray and seek His grace I hope I can discover again the wonder of His Grace to know how to handle another completely different round of fish guts. I find myself again looking for more ‘Fish Gut Grace’. If he did once he can do it again. I live longing for more ‘Fish Gut Grace’.